Similar Species: Eastern Ribbon Snakes (Thamnophis sauritus) are very similar but are more slender, have a white mark in front of their eyes as well as white marking around their mouths (as opposed to the black mark on scales around the mouths of Common Garter Snake). Adult Ribbon Snakes also tend to be brighter looking. Butler’s Garter Snakes (Thamnophis butleri) have a smaller head than the Common Garter Snake and is also only found in the lower Great Lakes region. Habitat: Garter snakes have adapted to a variety of habitats - forests, fields, wetlands and urban areas. Within these areas, they will inhabit dense foliage close to the ground and areas with leaves, logs and rocks. Diet: They eat earthworms, frogs, salamanders, fish, slugs, leeches and small mammals. Common Garter Snakes give birth to live young in late summer with typically 20 and 40 young per litter. A garter snake's first instinct when faced with an oncoming predator, such as people, is to hide. If backed into a corner, many snakes will try to bluff their way out through a show of temper. It is only once picked up that garter snakes will attempt to bite. They will also release a foul-smelling musky liquid as a form of defense. Incapable of long migrations, snakes must find a suitable hibernaculum close by (a place that gives refuge during the winter months) in which they can hibernate. They require a secure den with a temperature that remains above freezing. Because they are susceptible to loss of body water, their hibernation site must also be close to the water table (but not flooded). 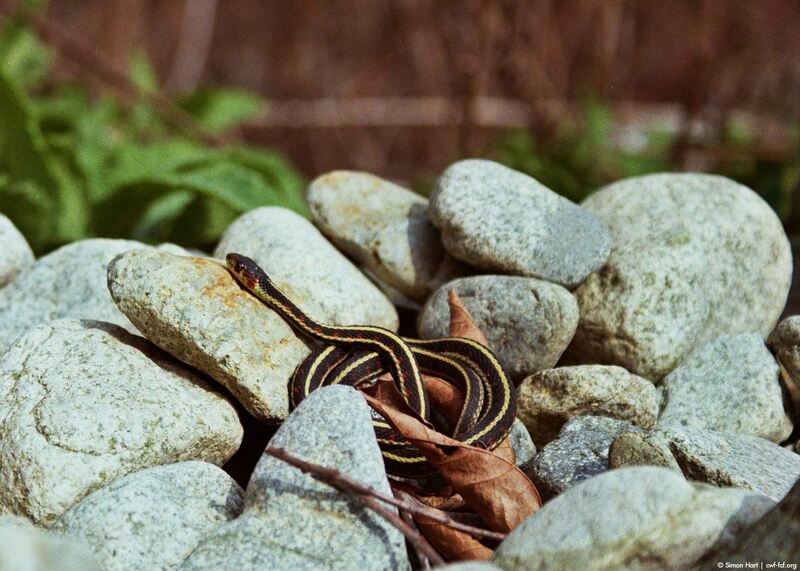 Common Garter Snakes eat a variety of animals and therefore play an important role in your garden's ecosystem. In turn, they provide an important food source for many birds and mammals. The red-shouldered hawk, in particular, uses Garter Snakes to help feed their young during the nesting season. A lack of adequate hibernacula is a limiting factor in the success of snake populations. You can help local snakes by building your own snake hibernaculum. If this is too ambitious, consider adding a rock pile or rock wall near sheltered areas for spring through fall. Snakes are cold-blooded, which means they are dependent on outside sources of heat to warm their bodies. A warm rock in the sun is a great place for them to soak up some heat. You can also encourage them to your garden with some wild areas with dense foliage close to the ground, leaf piles and rotting logs for safe areas to feed. Notes: The patterning of the garter snake allows it to blend into its surroundings, which is generally quite varied and irregularly coloured. The striping makes it less visible when moving through the vegetation - the continuous line belying its movement. CWF funding is helping researchers find new areas and identify overwintering spots for the snake.